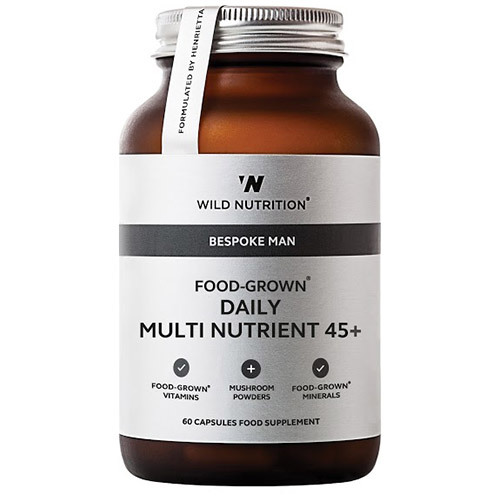 Wild Nutrition`s Food-Grown Daily MultiNutrient 45+ has been developed to promote optimum physical and mental wellbeing at this life stage. This combination of Food-Grown vitamins and minerals includes zinc for healthy testosterone production, vitamin D for normal immune function and the maintenance of normal bones as well as magnesium for normal muscle function. This bespoke combination is provided with alpha lipoic acid, NAC, lycopene, betaine hydrochloride and selected mushroom powders to support a demanding lifestyle. Our bodies produce less stomach acid as we mature and this can affect digestion and the absorption of minerals. Complementary botanicals and mushroom powders including reishi mushroom, pine bark extract and NAC have been added as natural reinforcements for a busy and demanding lifestyle. Vitamin C and Bioflavonoids incorporated in Citrus pulp; Mixed Carotenoids; Mineral enhanced Yeast providing Thiamin, Riboflavin, Vitamin B6m Vitamin B12, Biotin, Boron, Choline, Inositol, Vitamin D3, Niacin, Pantothenic Acid, GTF Chromium, Pro-Natured Co-Enzyme Q10; Lactobacillus bulgaricus providing Copper, Manganese, Selenium, Zinc, Molybdenum, Iron, Iodine, Folic Acid and Vitamin K incorporated in Alfalfa concentrate; Vitamin E combined in vegetable oil; Lithothamnion Calcareum providing calcium; N-Acetyl Cysteine; Purified sea water providing Magnesium; Lycopene from Blakeslea Trispora; Alpha Lipoic Acid, Pine Bark Extract, Reishi Mushroom powder and Betaine Hydrochloride, Vegetable Cellulose (capsule shell). If you are taking medication or under medical supervision, please consult your healthcare practitioner before taking any food supplements. Below are reviews of Wild Nutrition Daily Multi Nutrient 45+ - 60 Capsules by bodykind customers. If you have tried this product we'd love to hear what you think so please leave a review.